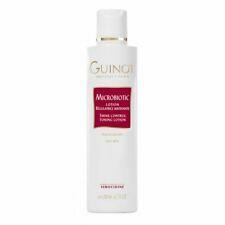 Guinot Microbiotic Toning Lotion 6.7oz. It is also used to tone and revitalize skin. Microbiotic Purifying Cleansing Foam (For Oily Skin) 150ml. Thoroughly cleanses skin & deeply purifies skin. Leaves skin clean & pure. 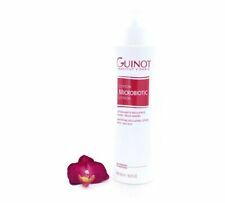 Give your skin a deep purifying cleanse with Guinot Microbiotic Mousse. This anti-bacterial deep cleansing foam will purify and re-balance your oily skin. It has a foam formulation that cleanses deep into your pores to remove and prevent bacteria, which causes spots. The Guinot Microbiotic Mousse has an acid pH curbs secretion, which leaves your skin shine free. - SEBOCIDINE COMPLEX: A complex of active ingredients which is the result of research carried out by Guinot, this complex regulates sebum secretion and purifies by means of an anti-microbial action. To Use: Apply to damp skin and massage using circular motions. Pay particular attention to oily areas. Rinse with tepid water. Use daily, morning and evening. 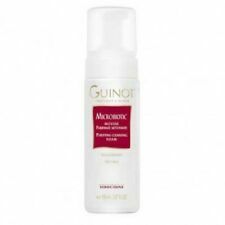 Guinot Microbiotic Purifying Cleansing Face Foam 5.07oz/150ml. The Microbiotic foam cleanses oily skin deep down, purifying the microbial flora. Its acid pH curbs secretions and provides a shine-free complexion. We are very serious against false claims. Any attempts with intend to manipulate our system will result in appropriate repercussions. Focus on oily skin. Replace Hydra Purete Purifying Toning Lotion 6.7 oz. It will also refine the pores and matify your skin by reducing the surface shine. Directions of Use: Dampen a cotton pad. Apply to your cleansed neck and face. For best results use morning and night. Microbiotic Lotion. 500ml Salon size. Use after the Microbiotoc Mousse (Purifying Cleansing Foam). Mattifying Regulating Lotion. Stabilises sebum secretion, tightens pores, and neutralises shine. Active component How to use Use morning and/or evening. It will also refine the pores and matify your skin by reducing the surface shine. Apply to your cleansed neck and face. We will always help you to have a 100% positive happy buying experience. Directions of Use. Size:150ml Give your skin a deep purifying cleanse. Micro biotic Foam is specifically designed for oily, acne-prone skin. With its unique texture and formula rich in emulsifying agents, Micro biotic Foam deeply cleanses oily skin while purifying and rebalancing the epidermis.